A biographical crime drama, White Boy Rick delves into lives destroyed by poverty and drugs with a patchy plot and uneven execution. It's 1984, and in crime-ridden inner city Detroit, Richard Wershe (Matthew McConaughey) is an uneducated and poor single dad making ends meet trading guns at the margins of the law. He promises his 14 year old son Rick (Richie Merritt) that he will one day open a chain of video stores, but that day never comes. Meantime, daughter Dawn (Bel Powley) is already addicted to drugs, with a crack cocaine epidemic sweeping through the city. Richard's parents Ray and Vera (Bruce Dern and Piper Laurie) live across the street but are of little help. Rick picks up his father's salesman skills and starts trading guns to local drug-running black gangsters, earning the title White Boy Rick and attracting the attention of FBI Agents Alex Snyder (Jennifer Jason Leigh) and Frank Byrd (Rory Cochrane). They pressure him into informing on his criminal associates, leading to a cycle of turmoil and violence for both Rick and his dad. Based on a true story, White Boy Rick breathes deeply from the foul air of urban decay and the flawed humanity it spawns. This is a story of place as much as it is a cautionary tale about characters. The gutted-out streets of Detroit, by 1984 a soulless city seemingly abandoned of all that makes a healthy community, are prime territory for the rule of gangs, drugs and guns. As much as Richard and Rick believe they can do something different and better, the odds are firmly stacked against them. Director Yann Demange places the sins-of-the-father theme at the heart of the film. Young Rick has no role model other than a shifty dad whose occupation is to buy guns from shady gun show dealers, attach basement-manufactured add-ons, and sell the weapons at a profit to whoever is willing to buy from the trunk of his car. Not exactly a foundation for success, and sure enough young Rick is soon perfecting his dad's formula, with less misgivings about who his customers are. At least Richard cares about his children and does try to be a decent dad, but he is also hampered by a lack of opportunity, talent and education. Outside of the immediate familial bond, the film noticeably sputters. The gang members are provided minimal definition, and the film bungles all of Rick's brushes with the FBI. Exactly what he did for the authorities and the value of the information he provided remain obscure details tripped over by a script more concerned with people than events. 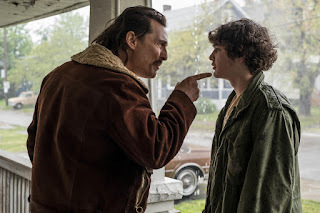 Matthew McConaughey brings a creepy intensity to the role of Richard Wershe, and whenever he is on the screen the film threatens to become more about the father than the son. In his film debut Richie Merritt is serviceable, but for long periods the purportedly central character of Rick is sidelined as an observer and a casualty of his environment. More sad than powerful or memorable, White Boy Rick crawls along the slimy underbelly of the American dream.